This lovely blend of four energy-boosting essential oils have been specifically chosen due to their properties of being natural stimulants and energizers. 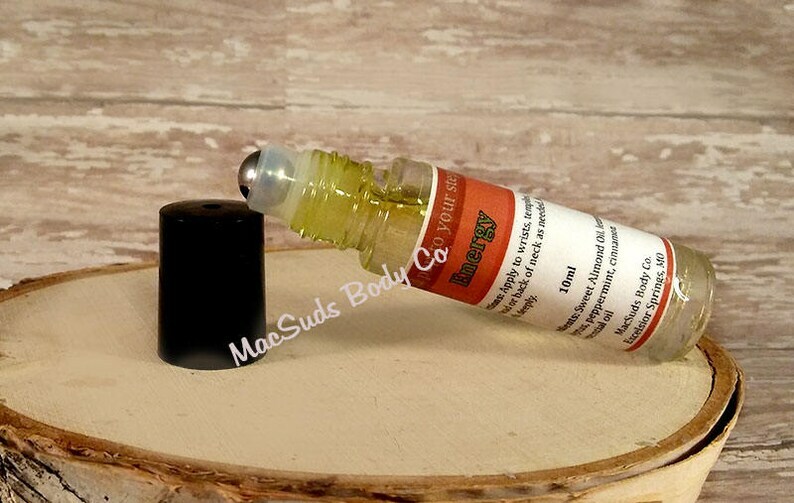 Aromatherapy Roll On Energy Boost: Apply on the neck, temples, forearm or chest when feeling tired or sluggish. At MacSuds Body Company I create 100% natural bath and body products in 2013, and i've never looked back. I believe in simple, safe products that are of the highest quality, that is why all of my ingredients come from nature, not a laboratory. I hope you enjoy this aromatherapy roll on as much as we do! Please see my shop for additional natural bath and body products. Because at MacSuds Body I have you covered from Head to Toe for all your natural body product needs. Very nice - does pick you up, especially if you dab some on in the morning. Great product! Another great product from this seller !!!!! !